We won’t make you wonder, our most popular building of the season is definitely the permit-free Glen Echo Bunkie! It’s a 10 x 10 building, so at 100 sq. ft. it’s permit-free in most areas! Can you say woo hoo!? Awesome. 3 foot front-overhang creates a bonus 130 sq.ft. half-storey loft space. Perfect for storage or extra sleepers. Efficient: Front and rear dormers max-out the loft space, enough for a queen size mattress! Customizable: You choose your doors and windows, we have over 50 to choose from. So you can gaze upon your lovely view! 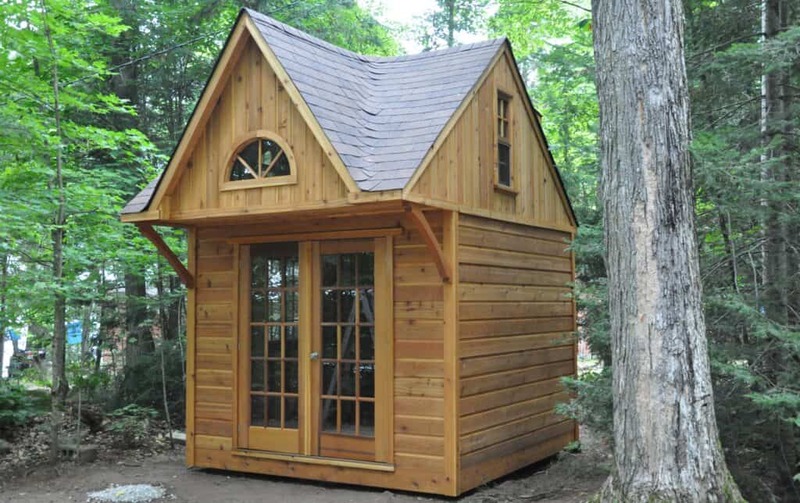 Stylish: This Western Red Cedar Cottage Bunkie is a lovely focal point. It may steal the spotlight! Includes an attic ladder which allows access to the loft area, but leaves usable floor space downstairs when folded up. Affordable! We’re a custom builder, allowing you the flexibility of creating a Bunkie that’s as elaborate or simple as you like. It’s the perfect addition to your cottage property for a lot less than building an addition and living through a renovation. Yes, we did say it’s permit-free, as it’s only 100 square feet! Also, it won’t affect your property taxes, so not only is it lovely to look at, it’s a smart choice. Who says you can’t be both!? Our 10 x 10 Cottage Bunkie doesn’t need a permit! Need inspiration? Here’s a few photos right from our happy customers! Click any of them for more information on our website. Our maintenance-free siding means no staining, ever! Downstairs Interior: or choose a bunk-bed, pull out sofa, or any furnishings you like. Drop-Down Attic Ladder: folds away, so you don’t loose main-floor space! Half-storey loft space, large enough for a queen size mattress! Want your own Ultimate Permit-Free Cottage Bunkie? Feeling inspired with lots of questions? We can help! Your family, your Custom Cottage Bunkie! sure! Please do not hesitate to quote any of our content should it be helpful! Thanks for visiting! Do you mind if I quote a few of your posts as long as I provide credit and sources back to your weblog? My blog site is in the very same area of interest as yours and my visitors would definitely benefit from a lot of the information you present here. Please let me know if this alright with you. Many thanks! I've been browsing online more than 4 hours today, yet I never found any interesting article like yours. It is pretty worth enough for me. Personally, if all web owners and bloggers made good content as you did, the web will be a lot more useful than ever before. Excellent post. I ussd tto be checking constantly this weblog and I'm inspired! Very helpful info specially the closing phase : ) I maintain such info much. I was sseeking this particular information for a very long time. Thanks and besst of luck.